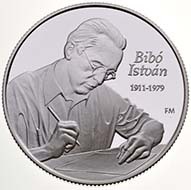 September 8, 2011 – On August 6, 2011, the Hungarian Mint issued a silver coin in memory of István Bibó, Hungarian Minister, writer and lawyer. On 14th August a gold collector coin was released in the series “The smallest gold coin of the world” on occasion of the 200th anniversary of Adam Clark’s birth. The Scottish engineer supervised the building of the bridge between Buda and Pest. 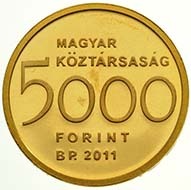 Hungary – 5000 Forint – 999 gold – 0.5 g – 11.0 mm – Max. mintage: 10,000 pcs, proof-like quality only – Designer: László Szlávics Jnr. In celebration of the 200th anniversary of Adam Clark’s birth, the Magyar Nemzeti Bank issued a gold collector coin, which is also part of the “world’s smallest gold coins” series. 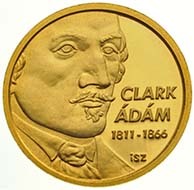 The coin was designed by László Szlávics Jr.; the back shows a young Clark at the height of his career, based on contemporary depictions. Széchenyi Chain Bridge in Budapest. Source: Silar / Wikipedia. The name of the Scottish engineer Adam Clark is well known in Hungary as he supervised the construction of the Széchenyi Chain Bridge and designed the Buda Tunnel. At the invitation of Count István Széchenyi, Clark first came to Hungary in 1834 to work on the delivery and commissioning of the equipment needed for regulating the Danube River. Following this project, he returned to England, where he continued working in the field of hydrologic engineering. In 1835, he was appointed chief engineer for the construction of the Chain Bridge to link the towns of Buda and Pest. Initially, he was deputy to the engineer William Thierny Clark (no relation), but from 1839 he was the construction supervisor for the entire project in Pest. Széchenyi later appointed him as advisor to the National Transportation Engineering Committee in 1847 and as a technical advisor to the Ministry in 1848. During the Revolution of 1848-49, Clark successfully thwarted Austrian attempts and then Hungarian attempts to destroy the Bridge, which was finally completed in 1849. Another outstanding work of Adam Clark was the Buda Tunnel, for which he finished the final designs in 1851, on the basis of the preliminary plans prepared by the engineering office of William Thierny Clark. He was the chief engineer and construction supervisor for the Tunnel, which was completed on 30 April 1857. On 6 November 1855, he married Mária Áldásy, daughter of Antal Áldásy, commander of the Castle of Buda. They had three children. Unfortunately, Clark did not live to see completion of the family’s villa, as he died on 23 June 1866 of lung disease. István Bibó’s interest in the philosophy of law, the relationship between law and power and the political development of Central and Eastern European states was fostered by his family background, as his father, an ethnologist and philosopher, was director of the University Library in Szeged. István Bibó. Photo ca. 1935. Source: Wikipedia. He received his doctorates in law and political science from the University of Szeged in 1933 and 1934, respectively. He initially worked as a court notary, before switching to the Ministry of Justice. From 1940 he was a private docent in legal sciences at the University of Szeged. Arrested in October 1944 by the Hungarian fascists because of issuing permissions for Jews, he escaped a few days later and went underground. He held office in the Ministry of the Interior of the interim national government in 1945-46. From 1946 to 1950 he was an instructor at the University of Szeged and the Institute of Eastern European Sciences, of which he was also acting director. Stripped of all offices, in 1950 he became the University librarian. In 1956 he participated in the reconstitution of the Petöfi Party (National Agrarian Party). 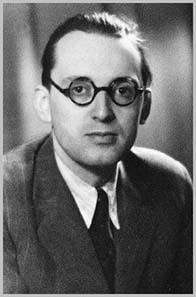 As his party’s candidate he was appointed Minister of State in the coalition government by Imre Nagy on 3 November 1956. After the revolution was crushed, he sought a compromise, but was later convicted in 1958 for publishing an analysis of the revolution and for his political behaviour and sentenced to life imprisonment. He was released as part of an amnesty in 1963 and worked at the library of the Central Statistical Office until his retirement in 1971. He hardly had any opportunity to pursue his creative intellectual work and publish, as he had to translate and take on side jobs. He was only able to publish the work, which he considered to be his most important, on the paralysis of international institutions, abroad in an abbreviated form in 1976. He was unable to finish or even begin the other works that he had planned. His earlier studies were in great demand starting from the early 1970s and only shortly before his death was he able to reach an agreement on their publication in Hungarian with his friends abroad. He did not live to see the publication of four volumes of his writings in Switzerland (European Protestant Hungarian Free University, 1981-1984). A selection of his writings (excluding those from 1956) was subsequently published in three volumes in Hungary (Magvetö Publishing House, 1986), and the final volume with the missing works only went to print in 1990. Hungary – 5000 Forint – 925 silver – 31.46 g – 36.61 mm – Max. 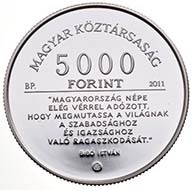 mintage: 6,000 pcs, proof quality only – Designer: György Szabó (obverse), Mihály Fritz (reverse). Marking the 100 anniversary of his birth, the Magyar Nemzeti Bank is issuing a silver collector coin. The front of the coin, designed by György Szabó, bears the inscription “The Hungarian people have already sacrificed enough of their blood to show the world their devotion to freedom” taken from Bibó’s proclamation of 4 November 1956. The back of the coin was created by Mihály Fritz and shows István Bibó at work at his desk. For more information on these coins click here.